For SMARTlab, a social enterprise founded in the UK at the OU BBC in the early 1990s, she has worked tirelessly, leading a team of scholars and technologists working together to invent and implement innovative technology tools for ‘real social change’ for marginalised and under-represented community groups and individuals, with an Inclusive Design Model enacted through each research project and performance. 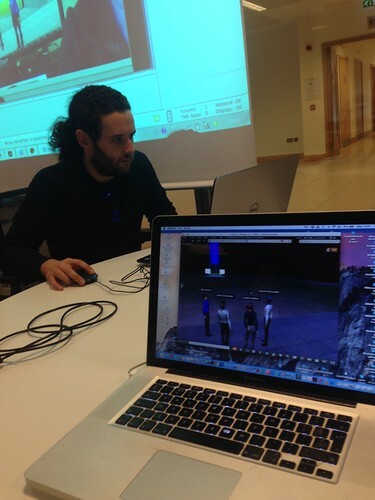 SMARTlab now supports PhD researchers within the Structured PhD in Education at UCD, leads major workpackages on Virtual Worlds for Learning and Games for Learning, and also regularly collaborates with industry and NGOS alike, engaging across sectors and cultures to work towards implementation of a more inclusive and empathetic society. It is in her capacity as a global action researcher and visionary thought leader committed to embodied, genuine and deep community interaction and research impact that is scalable as well as socially vital, that Professor Lizbeth Goodman has been nominated and selected by a global community of peers for this prestigious award. Lizbeth is Professor of Inclusive Design for Education and Chair of Creative Technology Innovation at University College Dublin, where she directs SMARTlab and the Inclusive Design Research Centre of Ireland at UCD. She was elected to Chair the Social Sciences Panel of the Irish Royal Academy in 2012. Previous to arriving in Dublin in 2010, she was Director of Research for Futurelab – Lord David Puttnam’s thinktank for the future of education- and served in that capacity on the Prime Minister’s SHINE Panel. For RITSEC in Cairo, she serves as Director of the Genius Award Programme. In 2008, she was awarded the top industry prizes for Best Woman in the Academic and Public Sectors, and Outstanding Woman in Technology by Blackberry Rim (awarded by the Industry judging panel in London). In 2003 she won the Lifetime Achievement Award (in Times Square, New York), for Volunteer Service to Women and Children, for her SafetyNET charity using technology to protect and inform survivors of domestic abuse worldwide. For SafetyNET she has worked extensively in India, Morocco and globally. From 2003-2008 she was proud to serve the Microsoft CSR Clubtech Programme as evaluator, documenter and then senior researcher exploring the EMEA development of that key educational technology initiative, which has to date served over 7 million of the least advantaged children and young people in the USA and globally. Since 2003 when she launched a new interactive dance for ability performance in Dublin at the pre-show for the Special Olympics, she has danced with and supported international technology teams to empower people of all levels of physical and intellectual ability to express themselves through dance, using assistive technologies including motion capture, robotics and haptics, animation, sensory control and eye-control technologies. She has written and edited 13 books and many peer-reviewed articles and broadcasts. Having previously supervised 38 PhDs to successful completion, she currently supervises and mentors PhD and MA dissertations and industry/research council projects in the areas of: Inclusive Design for Education and Creative Technology Innovation, Digital Media, ICT4d, Assistive Technologies for People with Disabilities and the Elderly, Technology Futures, Wearables and SMART Textiles, Performance Technologies, Assistive Tech, Technology Enhanced Learning for Health and Well Being, Connected Health, Personalised Electronic Health Systems, Digital Materialisation, Virtual Worlds for Digital Inclusion, Haptic and HCI integrated studies, and what Lizbeth calls ‘Meaningful Games’ or Mobile Games for Learning.